From cosmetics to children’s toys, brands increasingly are finding interactive ways to draw customers to the store. Through augmented reality mirrors and touchscreen monitors, beauty and toy retailers alike are creating customized, immersive experiences by utilizing these digitally-enabled technologies in their brick-and-mortar locations. The Coty-owned makeup brand unveiled an AR-enabled smart mirror to allows shoppers to pick up an item in the store and virtually try-on the makeup product. Using this in-store activation, shoppers can pick up a lipstick and their chosen color instantly will appear on their lips via the smart screen. Users then can complete their digital looks via on-screen eye make-up and blush tools, which are matched with their individual skin tones. Lxury retailer Neiman Marcus is leveraging Memomi’s digital-mirror technology to enable consumers to have a more frictionless sunglass-buying experience. To use the AR-enabled mirror screen, users can try on a variety of sunglasses in the mirror and the mirror will capture the reflecting, playing back the shopper’s previously-tried on picks before he or she makes a purchase. With this high-tech mirror, consumers accurately can decide which pair of sunglass they like best. The in-store makeup stations also use digital mirrors to record customers’ makeup applications upon their request. Correspondingly, if a customer would like, artists now can record a makeup tutorial on the digital mirror, breaking it down into segments—cheeks, eyes, etc.—and email the shopper recording to refer to at home. 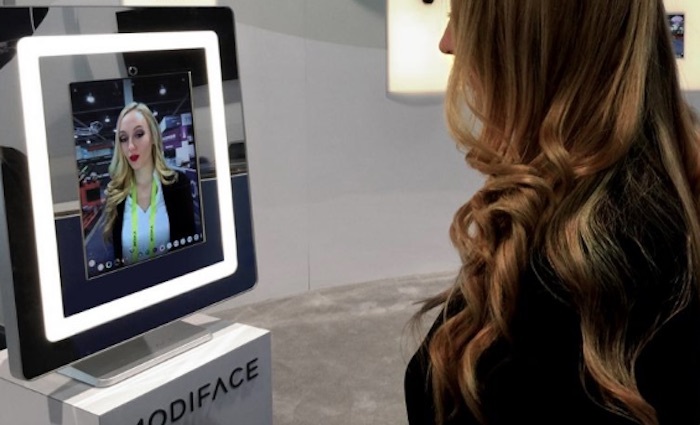 Modiface, an AR-focused beauty company, created ModiFace Mirror, which utilizes augmented reality to allow users to try on cosmetics by using photo-realistic makeup simulation through dynamic lighting, photo-realistic hair color and style simulation features. In discount retailer WalMart’s stores, toy shoppers are able to use touchscreen monitors to help them to identify the types of products they want to shop for or to order a specific item that they can’t locate on shelves. Through augmented reality tools, retailers increasingly are enabling shoppers to have more satisfying post-purchase experiences and are reducing rates of cognitive dissonance. By alleviating buyers of this common consumer pain point, brands are creating a more seamless customer journey and building a loyal consumer base for their products. For more information, see PSFK’s report Elevating In-Store Experiences Through Interactive Digital Touchpoints.